A fully welded angle iron frame for strength and durability. Rigid frame insulation stays in place to eliminate hot or cold spots. Dependent doors with the Blodgett turnbuckle support make it easy to operate the doors simultaneously with one hand. 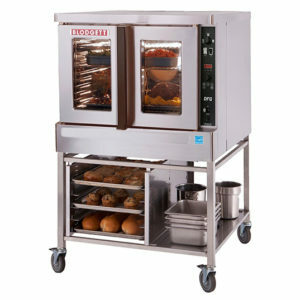 Double-sided porcelainized baking compartment liner prevents rust and prolongs the life of your oven. Heavy duty doors are triple mounted directly into the frame. Creating an authentic feel complete with the right ambiance is an experience that customers crave in their favorite pizza restaurant. 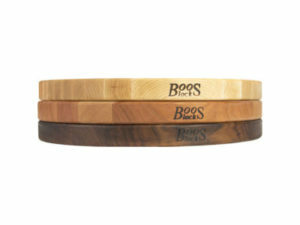 John Boos helps restaurants accomplish this feel with their round edge grain reversible cutting boards. Rather than cutting pizza on plastic, customers can be presented their pizza on a beautiful, authentic, cutting board. Made of all-natural, sustainable, and biodegradable American hardwood, these cutting boards are 18” round and 1-1/2” thick. Reversible for use in all types of food preparation, they can also be used for a display for different cheeses, pizza, and breads. Choose between 3 different colors; Hard Rock Maple (R18), American Cherry (CHY-R18), and American Black Walnut (WAL-R18). Transferring heat by using steam is one of the most efficient ways in the industry, saving you money! Steaming also helps retain the delicious flavor, nutrients, texture, and freshness of so many foods that the Blodgett SBF Boiler Free Steamer provides! 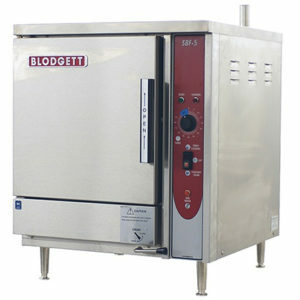 Available in a 3 pan or 5 pan steamer, the Blodgett SBF Boiler Free Steamer is electric, and can be installed easily with no plumbing. 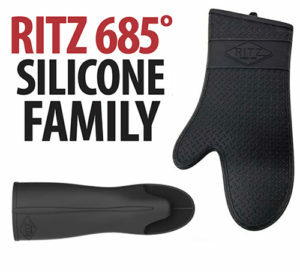 Keep your hands protected with the RITZ 685° Silicone Protective Oven Mitts! Kelly Saltsman from the John Ritzenthaler Company gives us a closer look of the RITZ 685° at the 2019 NAFEM Show. Kelly took a boiling pot of water and buried his hand into it with the RITZ 685° on, demonstrating its capability to be temperature resistant up to 685° Fahrenheit! It is said to be the strongest protection on the market, and they are FDA approved and food-safe. They have a silicone exterior, 100% cotton interior, a unique tread design for grip, and are available in a variety of sizes. Bleach resistant and dishwasher safe, the RITZ 685° protects against steam, boiling water, heat, fryer oil, and flames and they won’t smoke or burn in open flames. 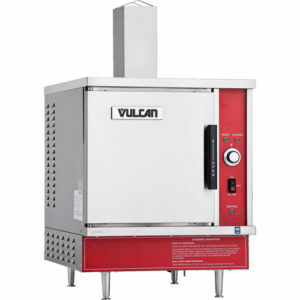 Best suited for operations that prefer to run on national gas or propane, the Vulcan VSX gas countertop steamer features electronic controls and ready / cook lights. An ignition light also informs the operator that the steam generator has filled, the gas burner has ignited and that the steam generator is heating. The 45,000 BTU/hr. 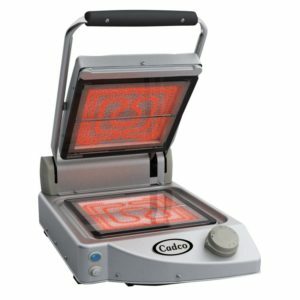 steamer also includes 4″ legs for countertop operation. A good mixer provides an equal mix of ingredients without over mixing the product. Choosing the right Globe mixer for the correct product is important, and can mean the difference between an overworked/underworked mix and the perfect consistency. If you plan on making just dough, then you want to use a Globe Spiral Mixer. They feature a permanent dough hook that gently turns in place. Below it, the bowl spins, continuously returning product to the turning hook. They also do not whip or beat, but instead gently knead the dough without too much friction or a rise in dough temperatures. This allows the gluten structures in the dough to form. They take up more kitchen counter space, but are shorter than a Planetary Mixer. 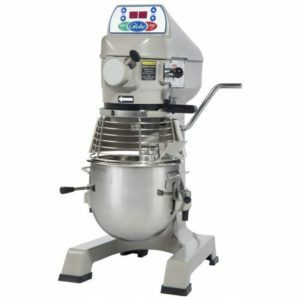 If you want to make dough, and other mixes, you should choose the more versatile Planetary Mixer. 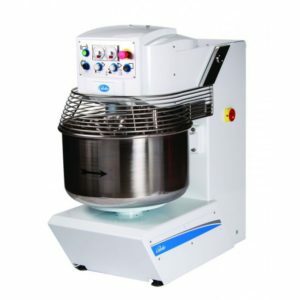 These mixers feature interchangeable agitators that can do everything; mix, whip, knead, and beat. 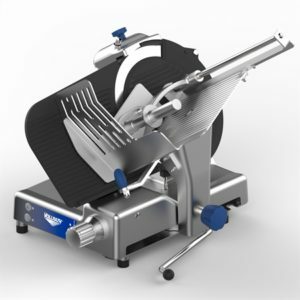 Another great feature of a Globe Planetary Mixer is the attachments that can be used to slice, shred, grate, shred or grind. So when you need to do a variety of different jobs, the Planetary Mixer is the one to choose. They take up less of kitchen counter space, but are taller than Spiral Mixers. As with anything in your restaurant kitchen, it is important to keep all appliances clean, and working properly. As for ice machines, they should be regularly cleaned every 6 months, and in some cases, more frequently than that. This ensures keeping food safe, and your machine working at its peak performance the way it was intended. If this cleaning schedule is followed, it will prolong the life of the machine as well. Luckily for us, Manitowoc Ice constructed an ice maker that is very easy to clean, without the need of any tools. Not only did Manitowoc Ice make it easy to clean, they even offer options that slow the growth of bacteria that can prolong the time needed in between cleanings. They also added an additional indicator light option for extra security. In the past, the only drawback to induction heating was that it only worked with certain types of pots and pans (magnetic metal like steel and/or iron). 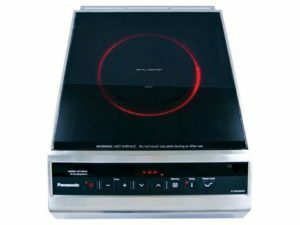 Panasonic has changed the way induction technology can be utilized! The KY-MK3500 with Met-all technology is a Panasonic exclusive technology that allows any metal pan to be used, and can’t be found elsewhere. The precise cooking that so many chefs about induction cooking is found in the exclusive Optical IR Thermistor Sensor that reads the temperature of the cooking vessel through the glass surface of the burner. If you have been wanting to use induction heating, but without the costly expense of induction pans, look no further than the KY-MK3500.